The National Weather Service warned people throughout the Puget Sound region to keep cool and drink lots of water. Temperatures are forecast to be in the high 80s and low 90s this week in Seattle, and meteorologists say the end is not in sight. The National Weather Service issued a heat advisory for the Seattle, Bellevue, Tacoma and Olympia regions, as temperatures reached the lower 90s today. The highest temperatures are expected between 2 and 8 p.m., according to the weather service. Seattle is least air-conditioned metro area in the U.S. So how do locals keep cool? Johnny Burg, a weather-service meteorologist, said the heat is caused by high pressure from the north bringing air across the land, instead of cool air from the ocean. Burg said nights won’t be cooling down as much, with lows expected in the low 60s this week in Seattle. Those sensitive to heat should take extra precautions, as the weather service warns that heat and high humidity can cause heat illnesses. Children, the elderly and pets should not be left in the car. The weather service recommends drinking fluids, keeping out of the sun and staying in an air-conditioned room. 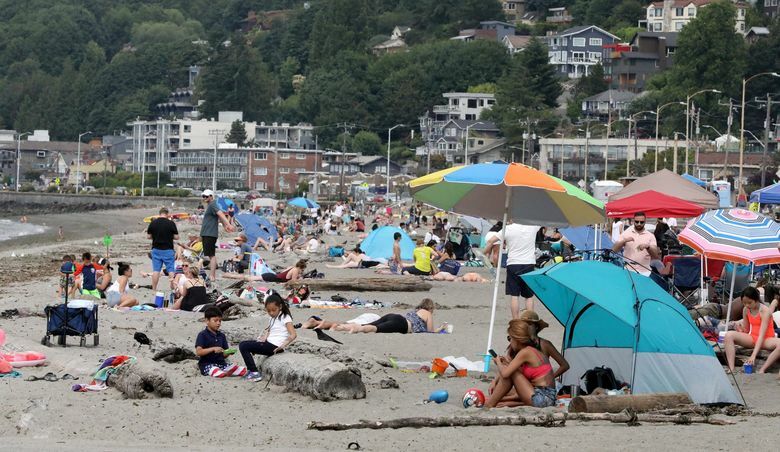 Seattle is the least air-conditioned metro area in the country, according to census data. If you need some tips on staying cool without air conditioning, check out this list from readers. Or you can take some tips from Burg, who said he seeks respite from the heat in his apartment’s underground garage. Burg also recommends opening windows at night and practicing some self control.